Kanye West Meets H.P. Lovecraft in ‘Kanye West – Re-Animator’! Ready for the strangest mash-up you’ll see this year? Joshua Chaplinsky brings his craft together with the beautiful work of the great H.P. 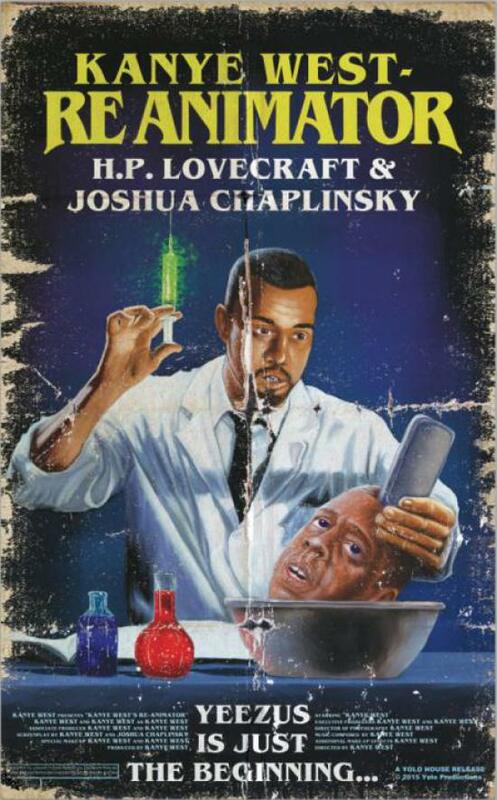 Lovecraft for the absolutely insane Kanye West – Re-Animator. This sounds just ludicrous on every level, which is exactly why our curiosity is really, really piqued. Could this be the most imaginative novella of 2015? We’ll find out on September 1st, when the book goes on sale courtesy of Yolo House Publishers . Synopsis: Appropriately, it started out as an experiment, where every time the name Herbert and/or West came up, I replaced it with Kanye. Then, I went through and changed certain details of the story to reflect Kanye’s biography. Finally, I discovered what the piece was really about and began turning it into a bizarre mix of Lovecraftian horror and hip-hop history. It puts a whole new spin on both the Kanye persona and Lovecraft’s original story. In it, Kanye attempts to reanimate a moribund hip-hop scene, only to come to the conclusion that his music is so powerful, it should be used to reanimate the dead. And who better to reanimate than those two legendary titans gone before their time—Biggie [Smalls] and Tupac [Shakur]? Hilarity and carnage ensue.